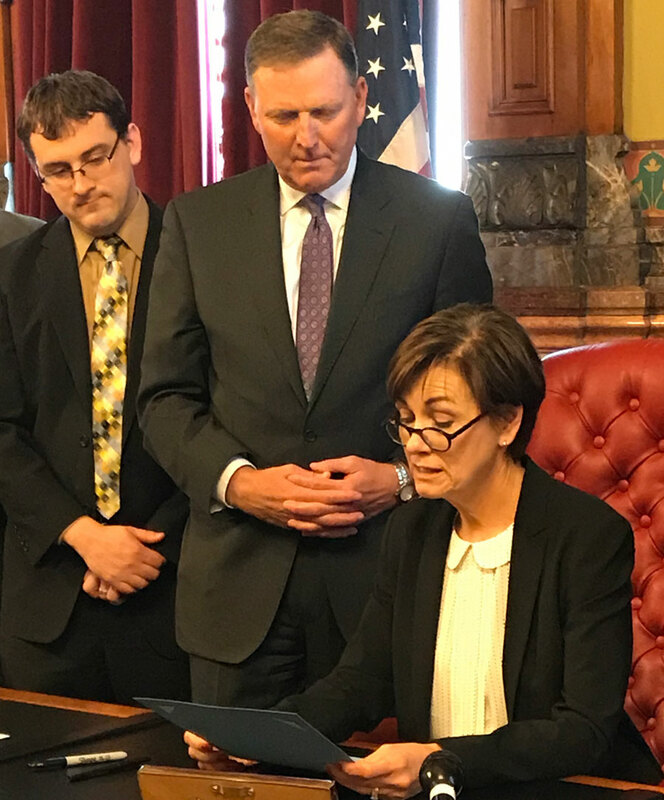 Governor Kim Reynolds signs the prayer proclamation. The governors of Iowa and Nebraska have declared this Sunday “a day of prayer” for flood victims. Governor Kim Reynolds said prayer can provide “peace and guidance” to those who’ve been profoundly affected by the weather conditions. “Throughout out history, Iowans have united in prayer to God to ask for strength and steadfastness in times of difficulty,” Reynolds said this afternoon. Reynolds and a small group from the evangelical Christian group “The Family Leader” then bowed their heads in prayer in the governor’s office. “As we call upon your name, we know that you are bigger than any flood, any disaster and we pray for your healing, we pray for your mercy and we pray for your restoration,” Bob Vander Plaats, CEO of The Family Leader, prayed aloud. Reynolds spoke with reporters afterwards, mentioning the four huge levee breaches that must be fixed immediately, as water from the Missouri is still flowing into the area around Hamburg and Percival. Reynolds said it’s going to be a long spring and summer — and it’s time for congress to quit quarreling and pass a disaster relief package. “They need to put politics aside and they need to realize that people are hurting,” Reynolds told reporters. Reynolds singled out Democratic members of the U.S. Senate who are running for president who blocked a vote on a disaster aide package this week, seeking more aide to help Puerto Rico’s recovery from last year’s hurricane. Senate Majority Leader Jack Whitver, a Republican from Ankeny, said earlier today that the flooding is “devastating” and has created a “dire situation” for many Iowans. Democrats in the U.S. senate are pressing to add $700 million to a disaster package that’s already passed the House, with much of that extra money going to hurricane victims in Puerto Rico as well as for rebuilding badly-damaged levees and water systems in the Midwest.